Hello precious memories.....I continue with my preparation to move and this past Saturday I pulled out the containers that held some of our children's special clothes. I, by no means, kept all their clothes, but I did keep those that I thought were extra special until they were about 6 years old. They all fit into one Rubbermaid container and I had to stop and look at a few of them. 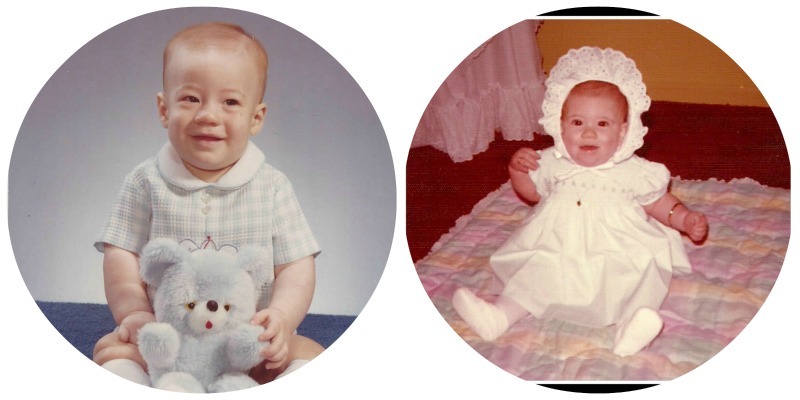 Of course, it brought back so many, many sweet memories of them and it made it even more difficult to believe that they are now 35 and 38. And, when I found this, I really had a "moment." Brandon only played baseball about 4 years but they were some fun times. He gave up baseball when he fell in love with golf. And, we thought that was a great decision. He and his Dad have enjoyed a lot of fun times on the golf course and it is a sport that he will be able to enjoy all of his life. Hello house progress....... For the past 2-3 weeks it has been busy, busy at the house. 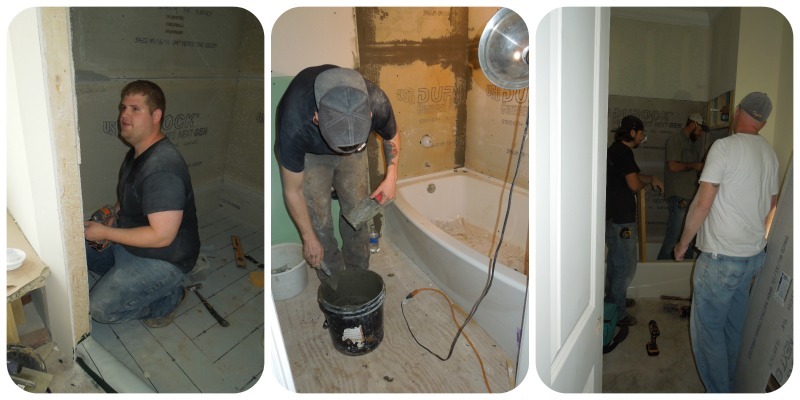 The prep work began by the tile folks for the Master shower and the shower surrounds in the other baths. The prep work is very nasty and has made me wonder how anything attractive can come from it. But, I'm pretty sure it will all come together and be exactly what I was hoping. 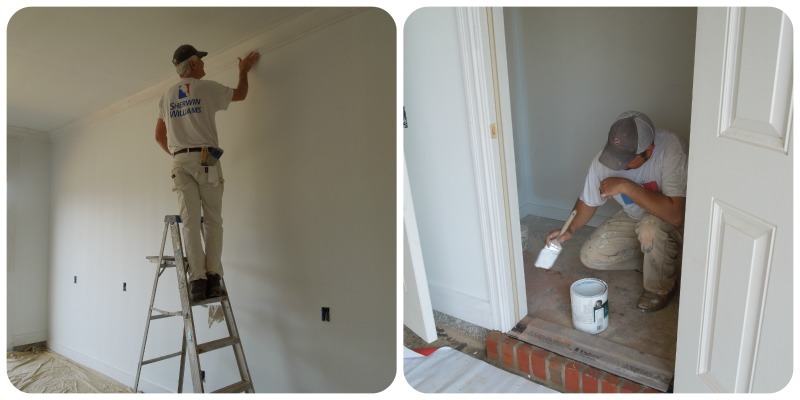 The painters continue with their prep work but they did actually paint Hubby's shop this past week. It is white and looks like a surgical suite. ~smile~ He should have no trouble seeing in there for sure. This is one corner of my pantry and those corner shelves will hold Lazy Susans. We saw this just a couple of weeks ago on the internet and asked our cabinet designer if he thought this could be incorporated into our pantry and he assured us it could. The Lazy Susans will be installed once the pantry is painted. It will be a super place for canned goods and nothing can get hidden from me. I have never had a pantry so you can only imagine how excited I am about this. This is the cabinet coming in from the garage. When it was first built it looked like the picture on the left and I felt like it looked like something was missing so I asked our cabinet man to redo it and make it wider. He was happy to oblige and agreed that it did look better once he redid it. He made it narrow because he felt like the corner was going to get in our way as we came through to go to one of the storage rooms. But, he rounded the corner and that should help. We had him make some changes on this wall of cabinets as well. Hubby felt like that each end of the cabinet should be raised to give a nicer look and to allow space to put items that I might be getting out of the cabinets. I am so pleased and have to give all the credit to Tommy for seeing the need for this. It will also serve as an area to have some decorative items as well. 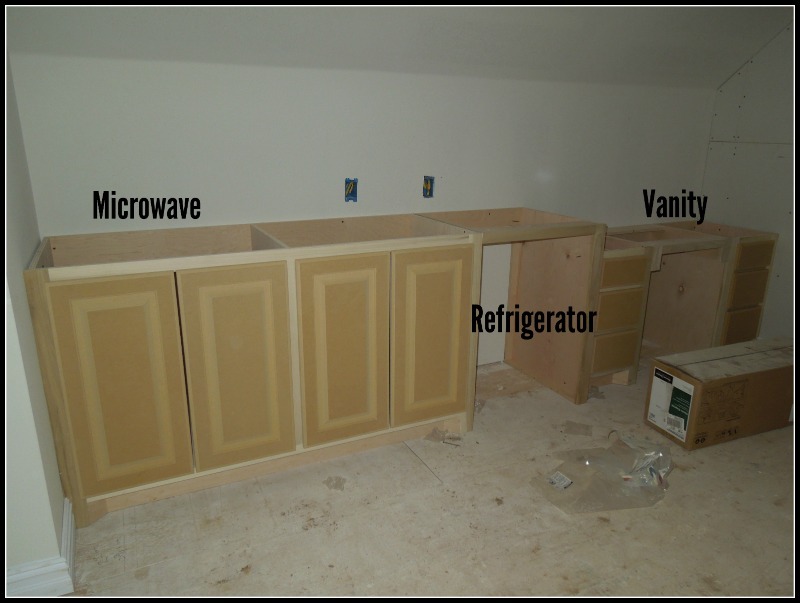 These are the cabinets we had put in the guest suite. For us not to have planned on making this area (above garage) anything it has worked out perfectly to make into a guest suite. The kitchen cabinets are finished except for the corbels under the mantel above the cook top. And, of course, knobs and pulls. 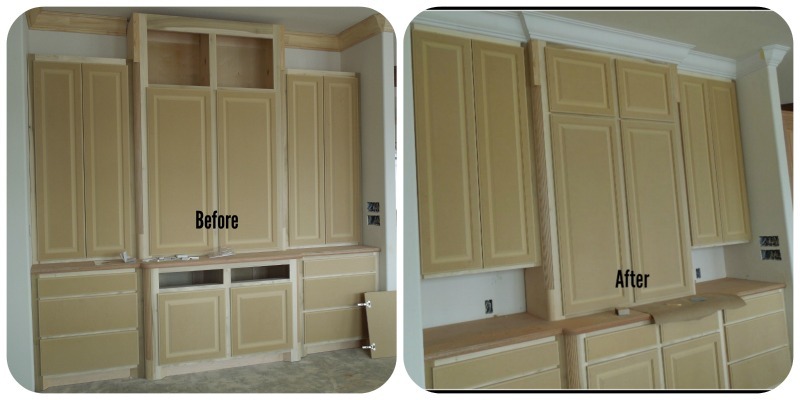 As you can see part of the cabinets are going to be painted and part are mahogany that will be stained. Our designer suggested this as Hubby wanted to have stained cabinets and I wanted painted. So, this way we are both happy. 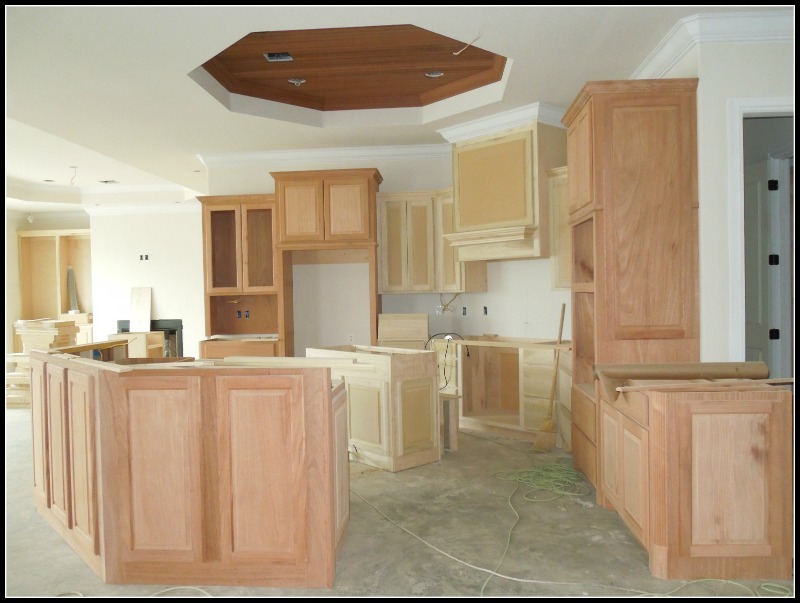 The small island will also be painted while the big island is mahogany. I'm not sure I have actually seen a kitchen with this combination but I'm sure excited about it. Things are moving right along and everything from this point on is pretty exciting. And, as I've said 4 other times, we are in desperate need of a driveway and if Mother Nature would hear our plea and give us lots and lots of sun for about 2 weeks then we might be able to get that taken care of. counter and cabinet against the wall. Good morning! I kept one plastic storage bin of Melody's special little dresses (and Halloween costumes) that I made her when she was little. But she took the box when we moved out of our big house as I really had to cut back on storage. I am truly loving all of your cabinets and storage. I did not have a pantry at our big house, and oh how I would have loved it. I do have a small (very small!) one now and it is good. The whole house is becoming such a thing of beauty. Enjoy your week! All I can say is those house guests of yours are pretty darn lucky. Enjoy your week. We've got some sunshine here, not a lot right now but enough to make me happy. But it's chilly and very windy, so it's not very nice outside. Wow, those changes you all had made really made a huge difference! We did something similar with a cabinet in our kitchen remodel at our previous house - it was a small kitchen, so I needed lots of counter space, but the cabinet made the entry in from the garage pretty tight so we put a regular cabinet with a small angled cabinet at the end - it was a perfect spot for cookie sheets and other larger items that take up some much room. 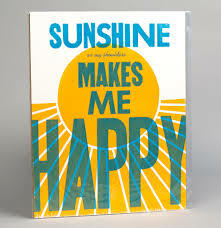 Happy Sunshiny Monday! Your designer husband did a great job! I love the changes. And what a great idea for the guest quarters. They will have everything they need right at their finger tips. So thoughtful. You will love the pantry and it is so well thought out. I don't think you've left a thing unturned. It's looking amazing - just love the kitchen!! Wow...I LOVE your kitchen, Lea! It's my dream come true, in fact! 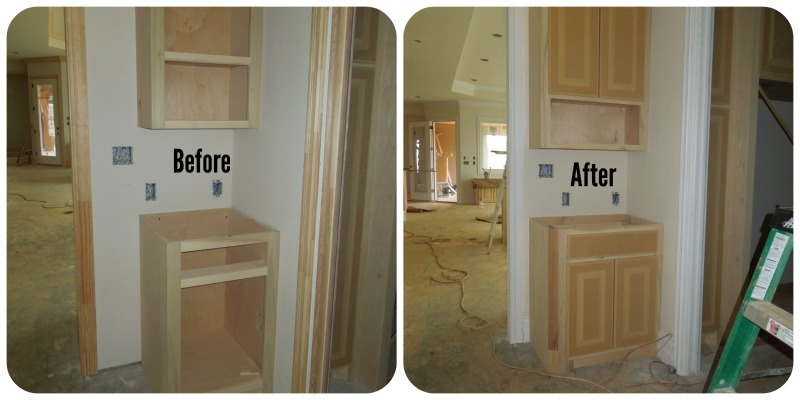 Cabinets galore! Love the idea of a guest suite equipped with a microwave. Well it's 28 degrees here and we still have feet of snow on the ground, so I do feel your pain. I love the house though! We're going to build too, so I'm collecting ideas. Can't wait to see the finished product! 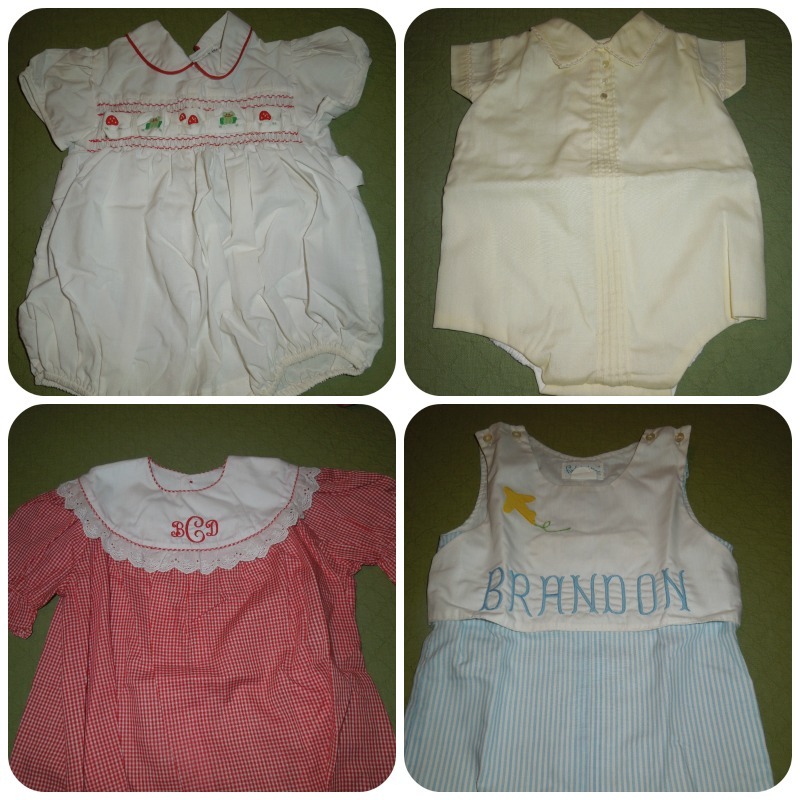 So many positive things to note about this post: cute kids' clothes from days gone by!! GREAT idea to have a guest suite with a microwave! Love your kitchen but what really got my attention was the idea to put a lazy susan in the corner of each shelf in your pantry! 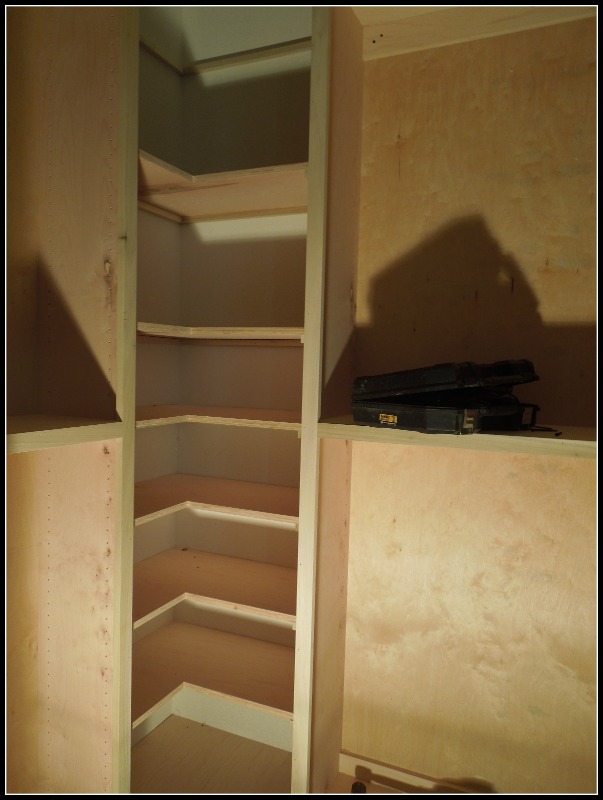 I have always had corners in my pantries and have been stymied how to deal with them. WISH I HAD THOUGHT OF THIS MYSELF!!! Oh walking down memory lane, so precious and such mixed emotions. The house looks wonderful and I know you are getting so excited. Enjoy! !